BAHAMAS, July 2, 2012 – Damianos Sotheby’s International Realty, based in the Bahamas, announces an exclusive partnership with The 700 Experience, an experiential travel and lifestyle blog about the 700 Islands of The Bahamas. The announcement marks the incorporation of the blog on to the recently launched new website of Damianos Sotheby’s International Realty Bahamas SIRbahamas.com, taking the experience from one to two online platforms. “This strategic partnership will undoubtedly increase awareness of the experiences to be had in The Bahamas,” says Vanessa Pritchard, founder and creator of The 700 Experience. “Damianos Sotheby’s International Realty sellers are no longer just selling Bahamian Real Estate, they are now selling the lifestyle that comes with it,” she continues to say that the same can be said for the buyers. ABOUT The 700 Experience: Vanessa Pritchard, founder and creator of The 700 Experience is a destined-to-be authority of resort travel, style and connoisseurship in the islands of The Bahamas. After leaving her career in New York City as Associate Account Executive at Full Picture, a full-fledged multimedia company at the crossroads of the fashion and lifestyle industries she returned to The Bahamas to fulfill the position of Sales & Marketing Manager at the famed mega-resort Atlantis. There she’d join a dynamic team with a cutting-edge understanding of the value in creating, marketing, and publicizing one-of-a-kind experiences. Looking at her career to date she realized the next logical step was to establish a platform on which she could publicize and market the authentic experiences, unique lifestyle and rich culture of The Bahamas. 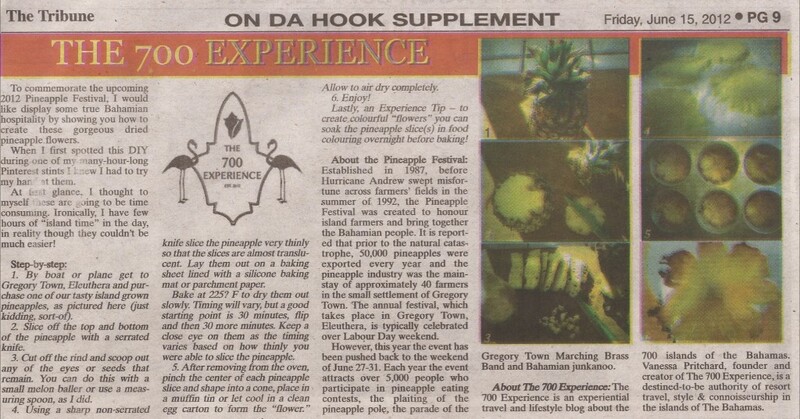 The experiential travel and lifestyle blog about the 700 islands of The Bahamas launched April of 2012. I am most pleased that The 700 Experiance is up and running.